Linda’s husband Reinaldo had a work-related injury in March 2014, and his doctor recommended a full knee replacement. As his primary caregiver, Linda saw how painful and arduous the procedure and recovery process was. Even with the knee replacement and physical therapy, her husband was still living with knee pain and constantly having to apply cold packs to the affected areas. Later the same year Linda, also experiencing knee pain, put off seeing her doctor as long as possible. When the pain in her knee became too much to bear, she went to see her physician. She got the diagnosis she had dreaded; she was recommended to have the same knee replacement surgery her husband had undergone. Then, Linda came to the Presence Saint Francis Hospital Pain Management Clinic where she was introduced to radiofrequency ablation (RFA) treatment. Dr. Baljinder Bathla, lead physician in the Pain Clinic and a specialist in physical medicine and rehabilitation and pain medicine, performs RFA treatments at Presence Saint Francis Hospital in Evanston. As one of the few anesthesia pain fellowship-trained pain physicians in the country with a background in physical medicine and rehabilitation, Dr. Bathla merges his musculoskeletal and rehabilitation expertise with the latest in pain management techniques. can last from six to 12 months. to each person and get them back to their daily activities. 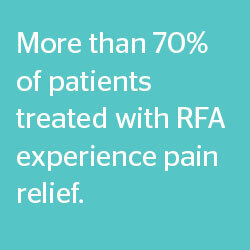 For Linda, RFA treatment was life changing. She felt relief from her pain almost immediately after treatment, and felt near no pain after just one week of her treatment, and has been pain free for well over a year. This summer, just two months after Linda’s treatment and a year after her husband’s, Linda and Reinaldo were able to take a mile-long summer stroll from Wrigley Field to Lakeview, one of their favorite things to do, deemed an impossible feat before the RFA treatment. Dr. Bathla at 847.316.2896 or make an appointment online.